Vail's Lucas Onan is bicycling across the country this summer to help build affordable housing with Bike & Build. Ain’t no mountain high enough if you’re Lucas Onan. The Vail ski instructor is spending his summer riding his bicycle coast-to-coast for Bike & Build, which does what the name suggests — bicycle expeditions are arranged around helping build affordable housing projects. Onan, 25, graduated Appalachian State University and headed to Vail, but he took the scenic route. 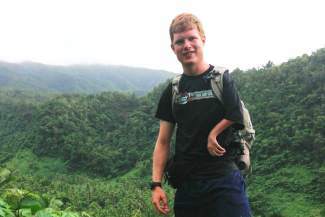 He was born in Milwaukee with arthrogryposis, a rare condition that left his left arm underdeveloped. His range of motion comes only from his shoulder. “It’s very handy as a clothes hanger!” he said, laughing. It didn’t slow him down. “It actually served as motivation to reach higher and push myself harder,” Onan said. He played high school basketball, captained his high school cross-country team and ran track in the spring. In college, he added biking and swimming and became involved with Campus Christian Fellowship. A road trip to Grand Teton National Park lasted the summer as part of a Christian ministry, putting on services around the park every Sunday. “It was one of the most profound summers of my life, both in the fact that I was outside climbing the mountains every chance I got, and that I was being challenged and growing in my faith,” Onan said. That led him to spend two summers as a mountaineering guide in a Young Life camp in the mountains of British Columbia. A college mission trip to South African squatters camps opened his eyes to the global housing crisis. People squat on land around Cape Town until they can legally stay there. That’s the law there. Squatters build homes with what they can find — cardboard, sheet metal, old wood … anything. “This experience opened my eyes to the need back in my home country. While the conditions here might not be quite as dire as South Africa, there is still a huge need for affordable housing,” Onan said. That put him in contact with Bike & Build, a cross-country bicycle trip combined with building affordable housing. “It’s a challenge, like many things in my life are, but just another challenge to overcome, a metaphorical mountain to climb, and boy do I love to climb mountains,” Onan said. Bike & Build was founded in 2002 and was running cross-country trips by 2004. More than 3,000 young adults have now ridden more than 1 million miles. Marc Bush founded Bike & Build in New York City after leading a cross-country trip with the now-discontinued Yale Habitat Bicycle Challenge in 2001. The organization migrated to Philadelphia where, always valuing function over form, the first office was a concrete box behind a 7-11. By 2012, they had outgrown that office and moved to an office with windows, parking spaces and carpet.